Now that the surreal moments of Wednesday night have had enough time to fester within my mind, it still somehow resonates emotionally through me at the most inappropriate moment like Christmas,New Years and my birthday all rolled into a finely wrapped hotdog wrapper. I honestly do not want to let it slide into my subconscious, but want it to surround and comfort me as we begin our quest at 5:07 today for another chance at the golden chalace. I want to still savory and hold tight this third bite into the MLB post season with the same intenity and fevor as I cherished in 2008 when we set sail on our maiden voyage into the turbulant land of post season baseball. But this time the waters are charted with landmarks, perils have been exposed and the journey is up to more than just fate and a sprinkle of luck. This time we came to play hard ball. Even though the sweet sticky remains of the champagne celebration have been washed from my clothes and body, it’s scent still lingers in a place where all memorable sensory experiences go to rejoice and to be remembered. 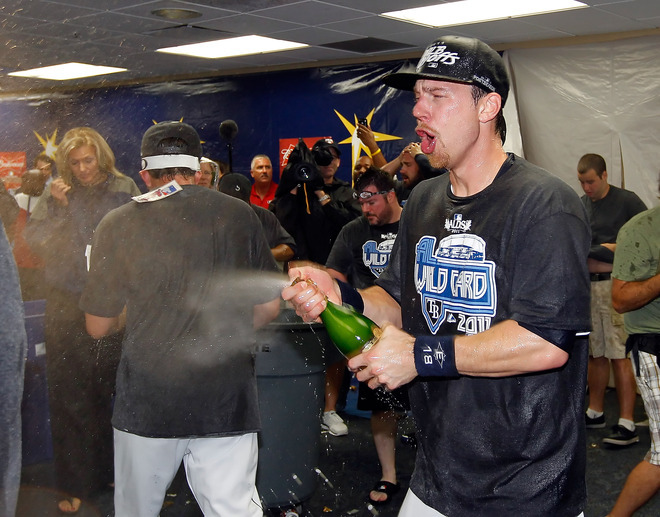 The first time I tasted that celebratory nectar it was anticipated, the second was a prize gifted out of this team’s knack for resilience, but the third, well the third time definitely is the glittering jewel. For this thrid venture into the Major League Baeball post season solidifies the fact the Rays are not a fluke, that this team was not granted anything. This third stroll into the playoff garden was not manufactured by the “Baseball Gods”, but by young martals who have strived all season long to live their long-haired sensei’s mantra of “Finding Another Way”. 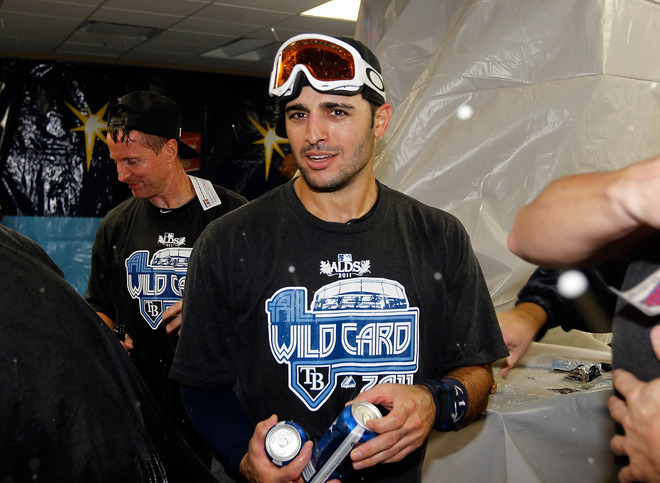 This Rays squad advanced into the post season not on their laurels or their past efforts, but on their own sweat, blood and tears. Whispers immediately emerged just past midnight Thursday that “the Yankees gave up” after the David (Baltimore) laid upon the corpse of Goliath (Boston). I am not sure of New York RP Scott Proctor’s mindset at the moment, but failure was probably not an option. I actually find it kind of poetic justice that former Rays, now Red Sox LF Carl Crawford who in my ESPN dairy basically set up the Rays internal fires to conquer the Boton behemoths played such a critical role in their advancement. Crawford did not know his miss of a liner by Oriole Robert Andino would set such a firestorm in motion. Proctor, who was on the mound when the news spread around the Trop like wild fire did not know of Crawford’s missed opportunity. 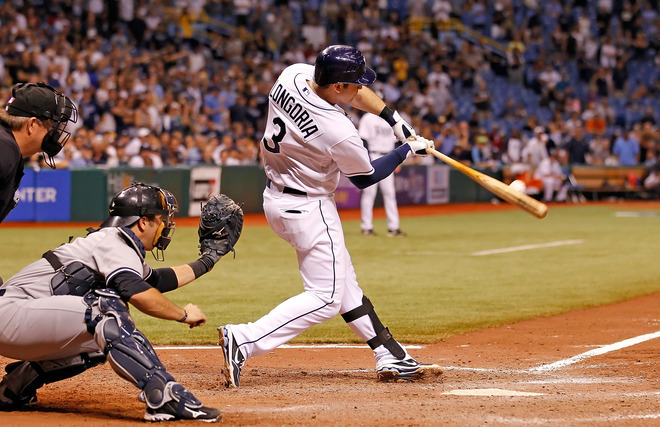 When he threw that ill faded pitch inside to Evan Longoria he had no idea that Longo would pull in his wrists, re-elevate the bat and get just enough to curl the pitch within a space just under Section 137 of Tropicana Field. Ironically, the same spot Longoria’s Home Run curved over was the same section of fencing taken down by the Rays stadium staff to help Crawford possibly steal a few Home Runs back in 2007. For once, it seemed the Rays universe had used its karma of “ what goes around, comes around”. With the ball clearing jut to the right of the 317 signage, I swear the Trop’s roof rose 5 inches. To say pandemonium broke out would be an understatement. What actually happened was an entire region exhaling at the same time, from a moment of sheer deafening silence to even Yankees and Rays fans embracing the moment. World came together, frustrations melted, hope,destiny,fate and their new friend karma all embraced during the scene. Finally those around baseball knew emphatically that this Rays squad was built to last, not to fade away like some others. The very fabric this team was built on was woven by the mantras and the teachings of Rays Manager Joe Maddon and his trusty quips and quos. 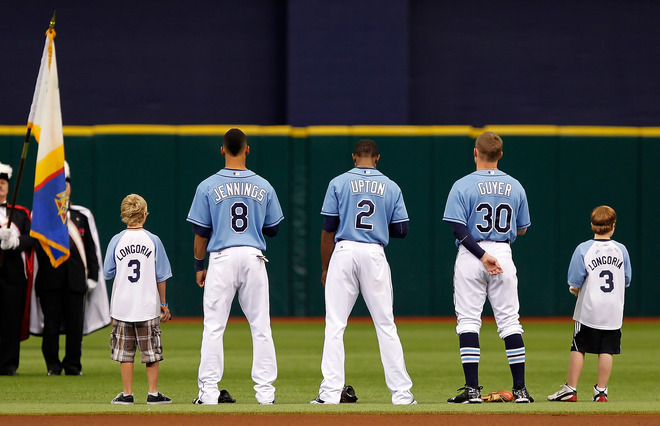 From 9=8 to 9>8 to “The Rays Ways” to the 2011 mantra “Find Another Way” this team has matured, grown wiser beyond their years and embraced youth along with veterans. What we truly witnessed Wedneday night was shocking to some within the baseball world, but in reality, they knew the potential was there. A new chapter starts today at 5:07 EST. 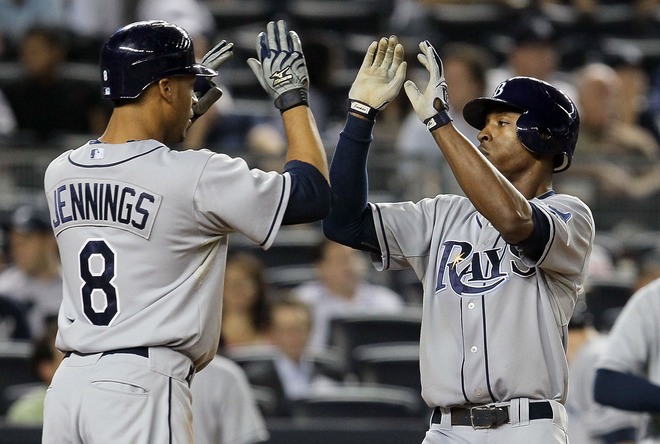 Even though it is a return engagement against a known ALDS foe, this time the Rays are coming. In their corner is the aspect of playing the last 2 weeks as if they were already in a “must win” scenario. Scratching, clawing, finding that “other way” to win. This series will be defined on who blinks first. Who wants it more. Who still has that drive within them when the dark cloud emerge. 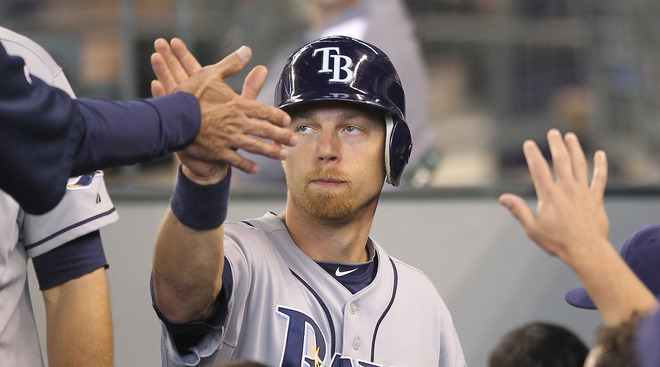 We already know the Rays have that fire, that intensity, that drive within them to be the last men standing. I know so many have already thrown the spotlight towards the Texas Rangers, and that is perfectly fine with me. Since their 1-8 start the Rays have made people take second glances, made even the best teams squander wins and leave the field wondering what happened. My prediciton, Rays in 5 games. Time to wrangle some Rangers. Words would just ruin the moment. Here is a photo essay of complied photos from the great AP photographers Mike Carlson / Chris O’Meara and Getty Images Photog J. Meric on the field and deep within the bowels of Tropicana Field tonight. .
Last, but not least, the Home Run trot that began the celebration! Wild Card Wednesday..Hope Your Ready? Today is the day. You have to play like there is no tomorrow, because to lose is to subject yourself with the possiblity of packing boxes for your journey home this off season instead of packing for Texas or Detroit and some really meaningful games. There is a lot still to play for here. Records are going to be shattered before the dust settles either on Wild Card Wednesday, or Titantic Thursday. After 5,392 strolls to the plate and 1,437 innings of hurling a little white sphere, the Rays most important 27 outs of their season come to fruition in game 162. Who in their right mind would have thought a squad sporting a team batting average of only .244 which is ranked 25th out of 30 teams in the Major Leagues would still have a legitimate shot at post season glory on the last day of the season? Someone slap me right now, I got to be sure this is not a dream. 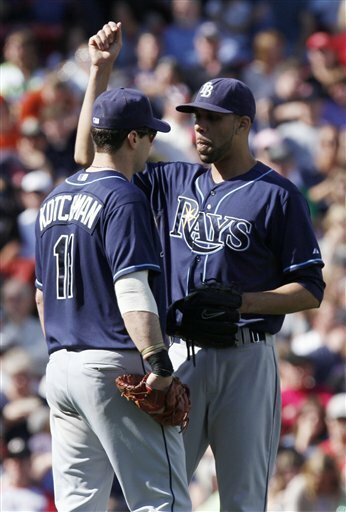 Did you know that from the duo of the Tampa Bay Rays or the Boston Red Sox the eventual American League Wild Card winner will become the first American League team EVER to go from 0-6 then gain a spot in the post season? 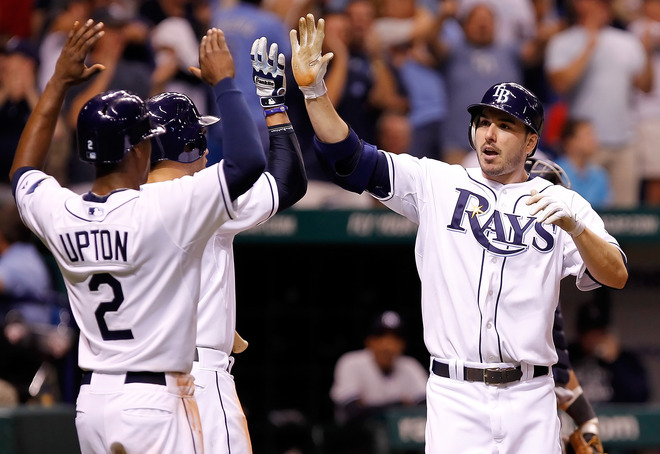 At one point the Rays way back in early April, they were in the AL East cellar with a 1-8 mark. 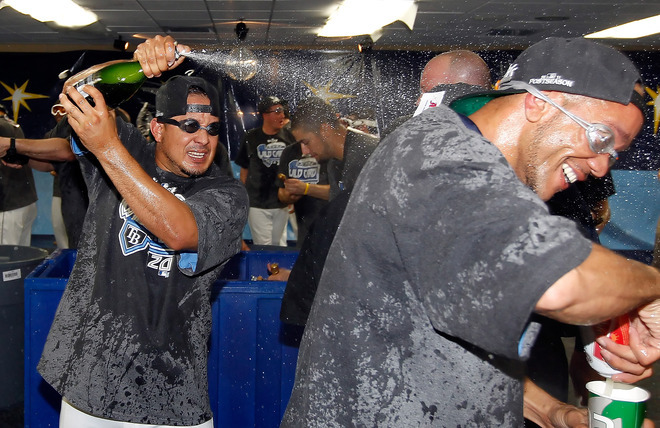 The Rays went on to harvest 89 wins since that low point. The most wins ever by a team that started 1-8 in the season. To put into total perspective, the Rays have gone 15-8 while Boston has floundered to a 6-17 mark since the Rays were 9 games out of any Wild Card consideration on September 4, 2011. With the Rays win on Monday night combined with a Red Sox loss, the Rays and Red Sox have not been on the same plateau in the AL East since May 23,2011….a period of over 126 days. Want another great eye-opener? With both teams winning last night, it will set up the 8th consecutive Major League Baseball divisional or Wild Card to possibly be decided during the final regular season contest. 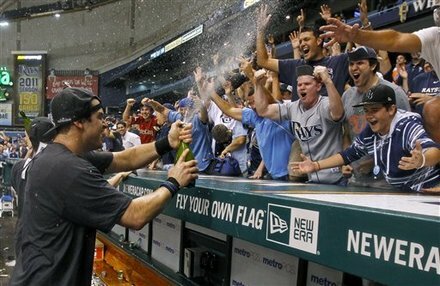 This is the type of environment and game intensity the combined 33 members of the Rays roster strive and dream about during the 180 days of the regular season….having a chance to clinch a post season berth at home, then having a chance to celebrate with the Rays 10th man(woman), the Rays Republic. 161 games in the books and the Rays are still very much alive and within a single game changing moment of the seasonal brass ring. Only thing that can defeat them now is their old offensive machine to turn into a 1972 Ford Pinto instead of a 2011 Ford Mustang. But I got a feeling Rays Manager Joe Maddon will have their engine purring, revving up the RPM’s like an old muscle car tomorrow night and ready to put the pedal to the metal, find that internal fortitude and bravado and thrust it deep into the New York Yankees midsections. I imagine there will be more than a few people in the training room after Wednesday night’s contest complaining of a sore neck going from the action on the field to just under the TBT Deck checking the out-of-town scoreboard with regularity. I truly believe both in my mind and in my soul the Rays have an impending victory cornered and just have to be sure not to give it away. In their corner is the simple fact the Red Sox have not won back-to-back games since late August while the Rays are sporting a 4-game winning streak. You want to think that winning tomorrow night would turn into a simple “win and your in” post season chance, but that could be farther from the truth. 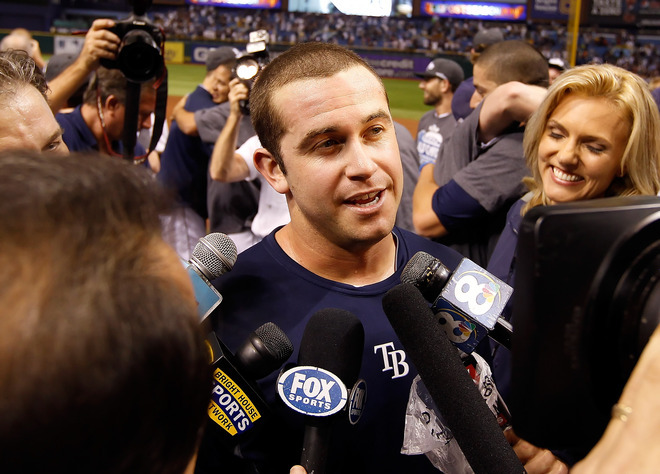 If the Rays play like they have over the past 4 games, play error-free baseball with a bit of an edge, then Evan Longoria and crew will have that brass ring in their hand tomorrow night. I have phoned my new friends Fate, Destiny and Hope who have have been in the stands over the past few days, they have told me their other friend Karma is really eager to come cheer and help the Rays in the finale. I have a good feeling about “Wild Card Wednesday”. 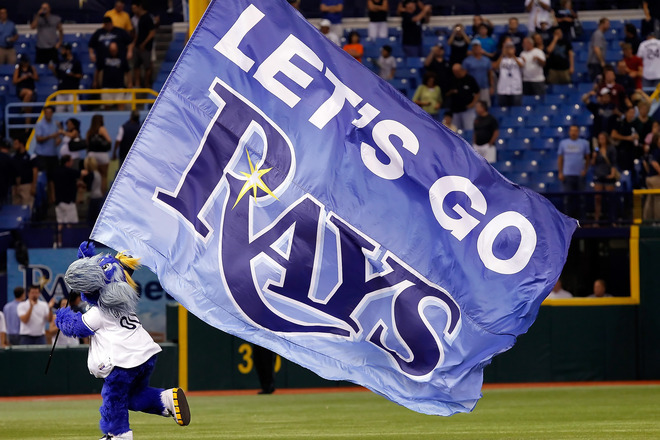 Now that the Tampa Bay Rays have let it be known to the entire baseball world that they want to be “Club C” in a possible 1-game playoff “winner, winner chicken dinner” type format, will there be more Rays surprises before the beginning of the Wednesday night season finale game at Tropicana Field? 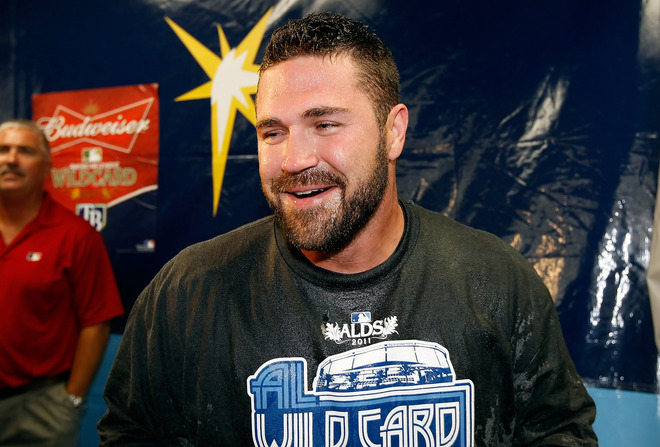 Could this team pull their own unforeseen “Wild Card” from their pitching deck of cards for a potential American League Wild Card determining game set for Friday, September 30th at Tropicana Field? Problem is, will the Rays pick a staff “Ace” or go with another card hoping for a little Rays good fortune. If the Rays have a gut feeling that they might be in line to use their previously announced “Club C” option of facing the winner of the game against Red Sox and the Angels, would the Rays go outside their usual comfort zone and play a hunch, possibly scratching Rays southpaw David Price from his last start of the season, giving the ball instead to top prospect SP Matt Moore. This scenario could easily play out if the Rays think they will be facing a one contest game of baseball roulette to decide if they are post season “worthy”. 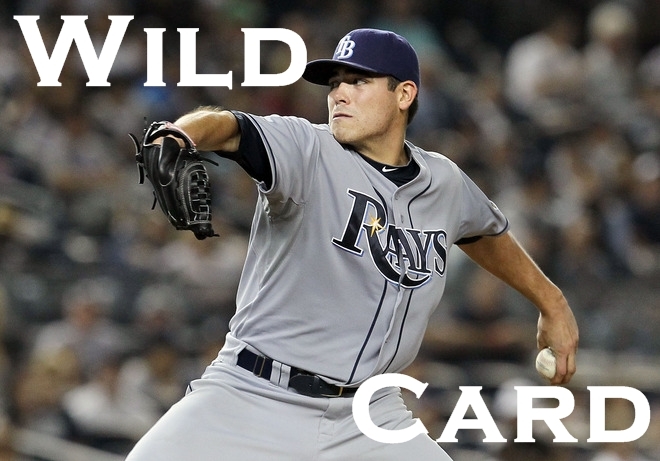 If it plays out even closely that the Rays would have a playoff game on Friday night in Tropicana Field, wouldn’t you want an Ace on the hill who can give you that win? 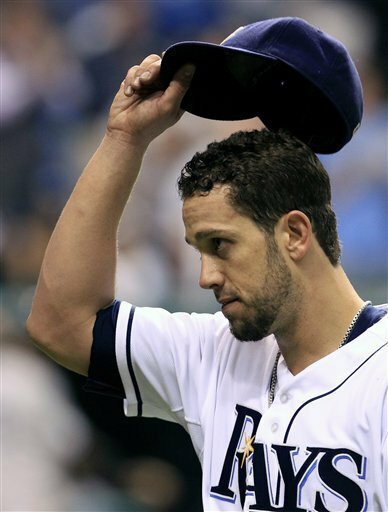 Some have said that fellow Rays starter/Ace James Shields could come back on 4-days rest and provide an a possible “Ace in the hole” sequence for the Rays for that Friday contest, but then you lose Shields in the American League Divisional Series until possibly Tuesday, October 4th which could line up to be Game 3 of the ALDS and a Rays home contest. If Price pitched on Wednesday and the team did not seal their fate that night, Price would possibly not pitch again until Game 3 of the ALDS if you go by the present schedule on MLB.com. Seems like the Rays might be doing some midnight oil researching the possible match-ups of each of these two pitchers against their ALDS hosts either the Detroit Tigers or the Texas Rangers. 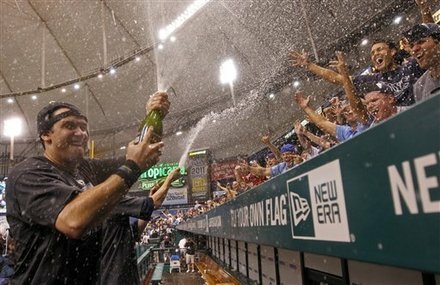 Kind of hoping for a Rangers versus Rays re-match…We have some unfinished business to conclude from 2010 . If Price is the starter of a AL Wild Card determining game on Friday night, he would essentially be lost until Game 4 or 5 realistically for the ALDS. But if Price pitched in the possible Friday AL Wild Card determining game, it would make Shields the heir apparent ALDS Game 1 starter, plus a possible second start in Game 4 or 5. The Rays might just have to play the odds, rub a few rabbits feet, possibly get Price’s palm read somewhere. 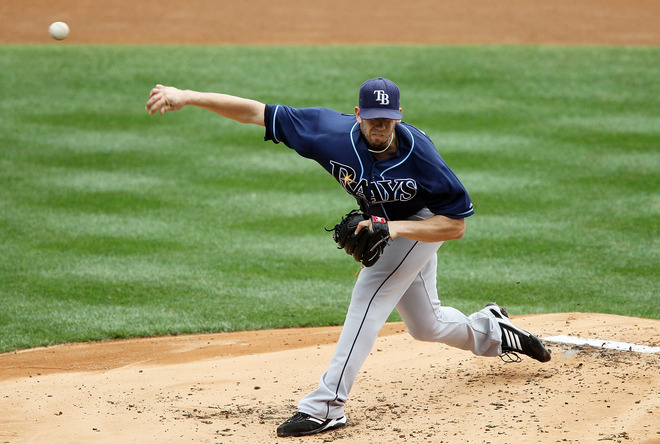 Or the Rays could pull one of the bravest moves of 2011 and end up giving the ball to Moore in a Friday deciding game of the Rays fate for the post season. Immediately people might think this is crazy, but Moore is definitely throwing the ball better than Rays starters Jeff Niemann and Wade Davis right now, so it might be a more statistically dominant suggestion over Shields or Price. Not trying to throw the Rays young prospect into the fire here, but if you need dominant pitching and a guy who neither the Red Sox or Angels have scouted with a huge amount of game film, Moore might be a nice monkey wrench to throw into the works. That also would free up Shields to be the ALDS Game 1 starter, with a potential for another ALDS start in Game 3. Then you might have Price come back as a potential ALDS Game 2 starter if the MLB schedule changes enough for Game 2 to be moved to Monday, October 3, and also be on the hill (if needed) for a deciding Game 5 in Detroit. Here is where it gets tricky and you almost want to be in on the wave length conversation between the ears of Rays VP of Baseball Operations Andrew Friedman. But some thing are easily apparent, and should make trying to decipher Friedman’s brain waves a non-brainer (sorry Andrew). When you consider Rays AL Rookie of the Year candidate Jeremy Hellickson is a better option than Davis or Niemann in Game 2 or 3, that could lead to an odd scenario of the Rays 4th starter even getting a chance to throw considering the travel days schedule, or if the Rays are in a “must win” situation. For some reason Moore’s name keeps flashing within my mind as the key “Wild Card” to the Wild Card. If the team uses him on the mound for the Wednesday night regular season finale, it places possibly David Price as the potential Friday night starter. If Price starts on Friday, it would push him towards the back end of the pitching probabilities for the ALDS. If you put all the cards on the table, look at them realistically for a moment, Moore should be the Friday night starter if the Rays have a 1-game last ditch shot at the post season. That way the Rays would have Shields on the hill for Game 1 of the ALDS, either Price ( even on 4 days rest) or Hellickson for Game 2 in Detroit. But then again, this all could become moot if the Rays run the table winning both of their remaining contests and the Red Sox stumble against in Baltimore, or Texas eliminates the Angels threat. I still think the double nickel (55) will be the Wild Card factor, I’m betting on it. I don’t think any of us saw these three completely different ladies stroll into Tropicana Field this Sunday. Each of them had different agendas and reasons for being among the 21,008 screaming members of the Rays Republic. By the end of the game though, each knew they were in the right place and firmly gave their commitments to helping this Rays team succeed. One was there striving to help this young squad that was counted out in early April harness their desire and expectations heading into the Rays final 4 games. She had wanted to give this team a trust and reliance that the fulfillment of their goal was well within their grasp. Her presence has adorned the Trop for a long time this season, but today she made an “ official” appearance. The second came today to remind this team that the course of human life is never pre-printed or ordained, that spirit as well as courage can sometimes change the sands of time. That she wanted to give a blessing of cause and will to this team as they venture into the final stages of 2011. That she might not be able to give them total control or deed them to success, but she knew the path and was willing to guide them there with no hesitation and no payment in return. Third lady came today to remind this team that something can be predestined, can be decided way before their time, but that the will of man can change the course, can re-direct the energy and that fortune both good and bad doesn’t always fall on the lucky or cursed. That sometimes the ones who bond together, who all believe the same path of movement can achieve things beyond their dreams, even changing their end result. What all three saw today was a team before them who had a chemistry about them that was unshakable by feats of other common men. A spirit that rivaled any other other force seen upon this Earth whose ebb and flow moved in unison between both the players and the assembled fans. 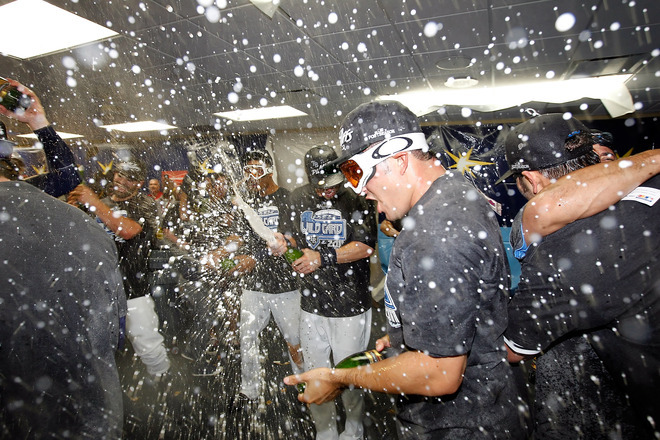 They saw an explosion of emotion, a combustion of suppressed energy and a visual display of unified exuberance all around them as the Rays moved towards their 5-2 victory over the Toronto Blue Jays. Each gathered their thoughts, sights and recollections throughout the contest speaking with zeal and emotion taking in everything and forgetting nothing. After the game ended I approached these 3 ladies who looked emotionally exhausted, but full of fire and energy. I asked if they had been here before and they told me they had attended games in 2008 and 2010, but this was their first journey here as a group this season. I commended them on coming on a day that had so much great game action and excitement throughout the contest. 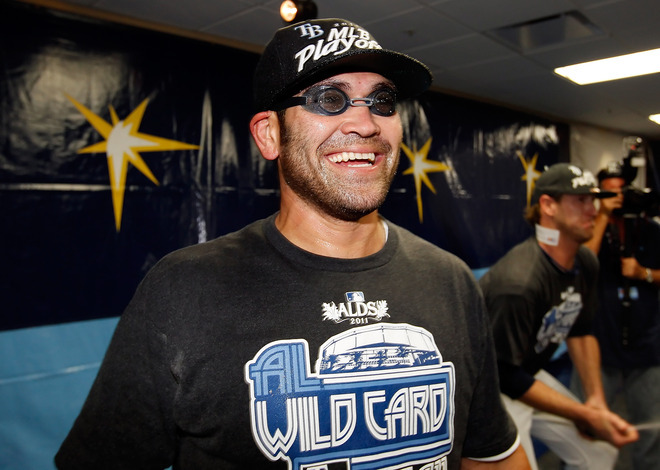 2011 is the 10th anniversary of the Tampa Bay Rays up tempo slogan “Heart and Hustle” that signified and branded a Rays squad consisting of a hodge podge of vets and rookies who meshed together to play a energized style of Rays baseball. Sounds kind of familiar? 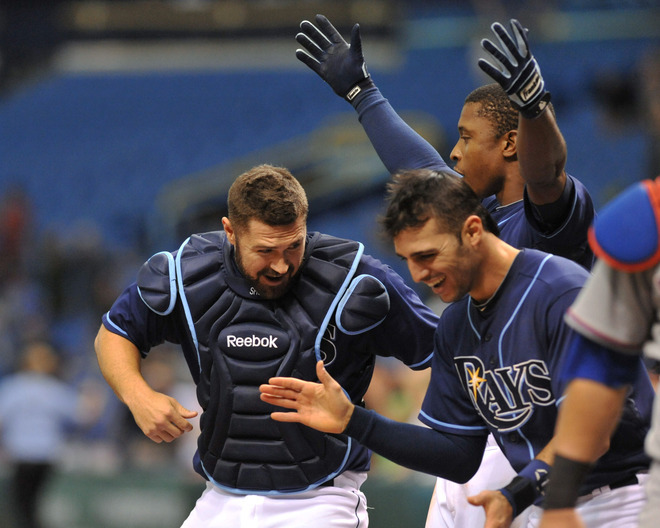 That same highly energized and enthusiastic slogan could easily be stamped upon this 2011 Rays squad. Truly it is the essence of this team’s “ fire in the belly “heart and “never say die” hustle that has lead this ball club from the April darkness of the American League East cellar to them gaining momentum, slowly escalating onward and upward towards a 6-game shootout with the slumping Boston Red Sox and surging Los Angeles Angels for the potential AL Wild Card post season prize. 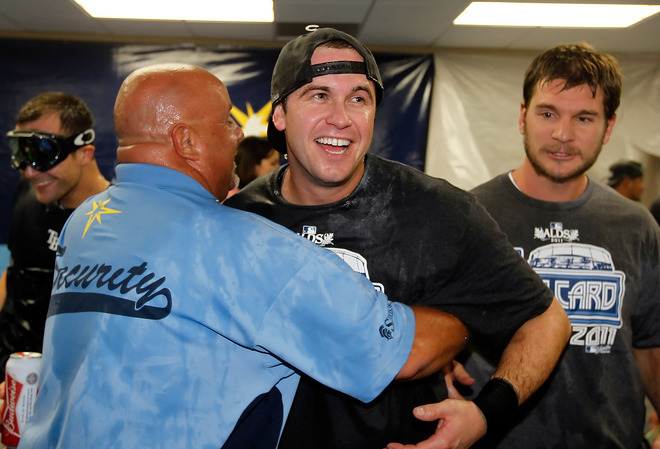 Even 10 years later, heart and hustle still seem to be firmly within the foundation and backbone of the Rays team culture. 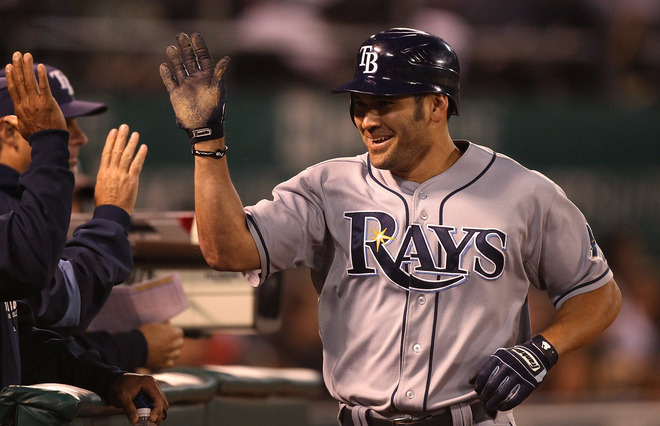 From the extreme performance last night from their youngest player on their roster RP/SP Matt Moore to a their oldest “young at heart” performer OF/DH Johnny Damon who only has to look at his ring fingers to visually show he can help lead this young maturing band of baseball brothers to that last glorious plateau in late October. I mean how can you root against a team where Damon, who was born in 1973 is still grinding out extra base hits and stealing bases like rookie sensation Desmond Jennings. 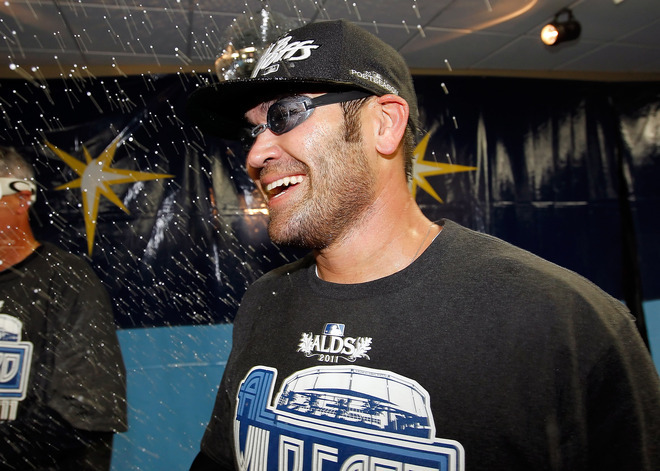 Just because Damon is adding nightly to his future Hall of Fame resume, the pure magic he sees within this team is not lost on him that the Rays have the drive and confidence to take this thing to its final destination, then party like rock stars. 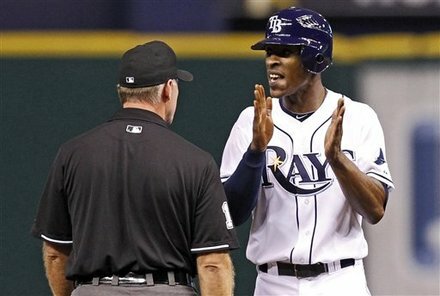 Even the Rays usual whipping boy B J Upton has pushed his numbers high and higher as the number of games diminish, possibly knowing within his mind this might be his last chance at post season glory with this Rays club before the Winter could dish out a harsh reality to him and the Rays Republic. Right now Upton is playing like a man possessed, or who knows the window of opportunity is beginning to be shut. Do not get me started on this Rays rotation where from top to bottom we have seen 10+ wins by each starter, and had glimpses of magic from often maligned SP Wade Davis and Jeff Niemann. We have seen Rays rookie Jeremy Hellickson get a secondary nickname just for 2011, “HellROY” as he burns towards the finish line. 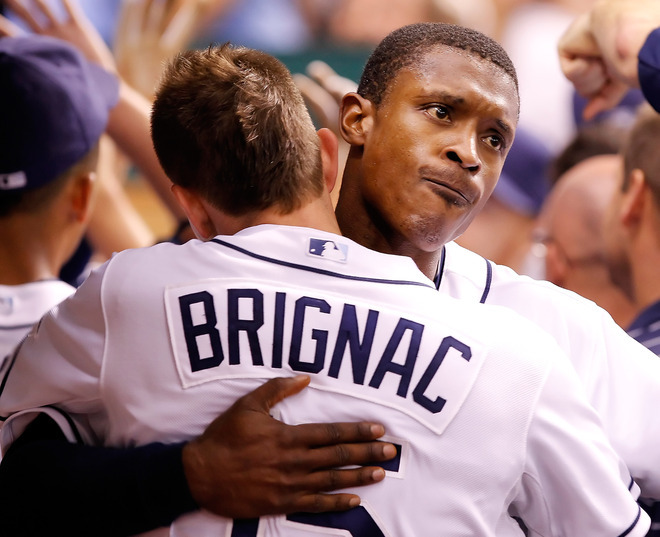 Even the Rays rookies are set to make a little history of their own as Jennings needs only 2 stolen bases over the next 6 games to become the first AL rookie with 10 HR and 20 SB since the Rays own Rocco Baldelli and Kansas City’s Angel Berroa set the mark in 2003. 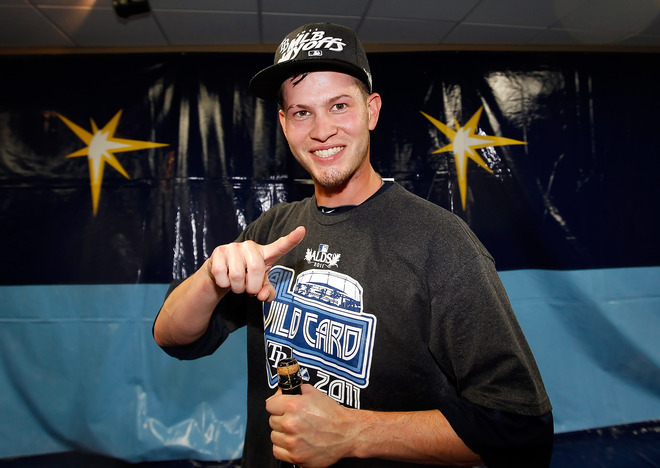 Hellickson has a .290 ERA and a .208 opponent average, the fifth best rookie performance…ever. Rays Manager Joe Maddon’s mantra of “pitching sets the tone” has definitely sparked some beautiful music from his hurlers as the Rays collectively have held the American League to a .236 average. The last AL team to post such numbers was the 2001 Mariners who had the same .236 average. 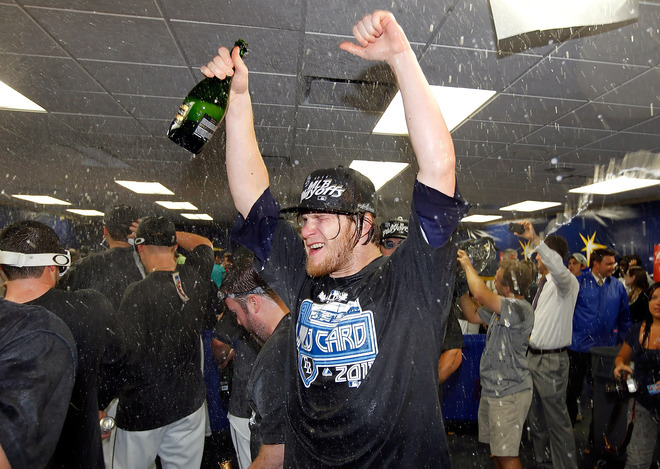 Oh, and by the way, that Mariners club made the playoffs. Rays starters have gone 7+ innings 77 times, 21 times more than the second closest squad, their AL East rivals the New York Yankees. 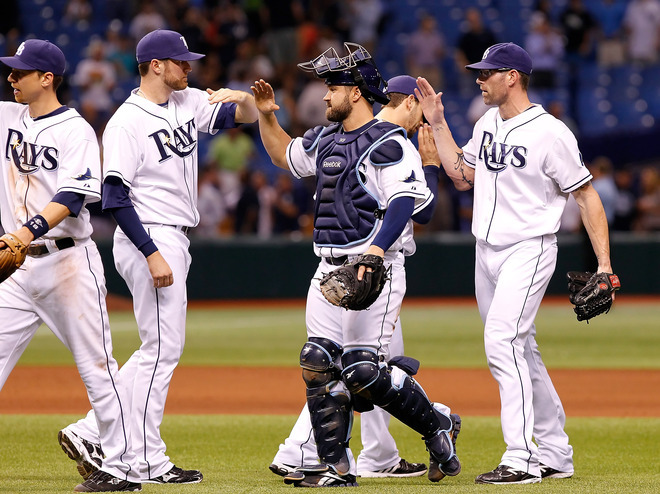 Amazing enough, this Rays pitching staff has thrown 1,024.1 innings (most in AL) and leads the AL with a 3.51 ERA, 15 complete games and has allowed an AL-low 593 runs. All this by a staff that has seen all 156 prior 2011 Rays game started by pitchers drafted and developed by the Rays, the only team in the majors this season who can boast that claim. Plus, they are riding a 758 consecutive streak of starters under the age of 30…an MLB record. Along with their upward trend in pitching, the Rays have solidified their overall defense to the tone that the Rays have committed the least errors in the Majors (69), and their combined .988 Fielding Percentage is tied with NL powerhouse Philadelphia for the top slot in the MLB. Talk about “hustle”, this Rays team has committed only 4 errors in their last 17 games, and only 17 in their past 53 contests. 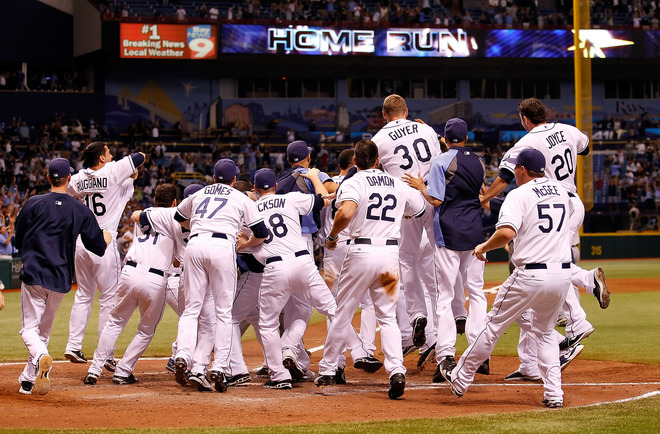 If ever there was a Rays team that demonstrated that mantra of “Heart and Hustle”, it is this 2011 squad. 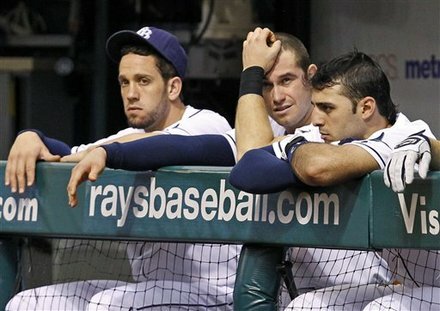 This Rays squad was 9 games out of playoff contention on September 2, 2011. 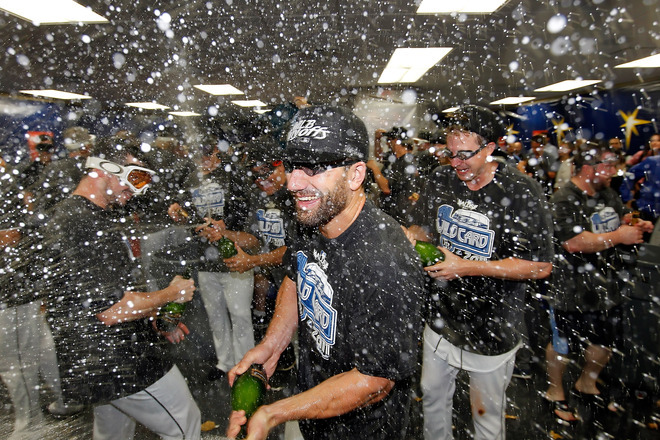 No other team in MLB history has overcome that many games in September to get into the post season. The closest comparison would be the St. Louis Cardinals (who trained in St. Petersburg, Fl) who were in 3rd place and trailed the Philadelphia Phillies by 8.5 games on September 3, 1964. History is definitely on the Rays side right now as the Rays have already secured their 4th straight 10 win seasonal series against tonight’s foe, the Toronto Blue Jays, the most against any Rays opponent. 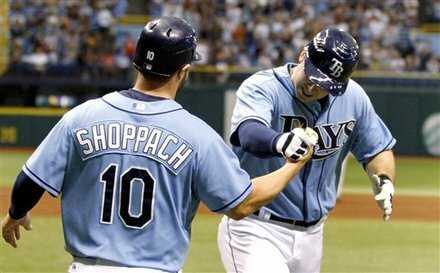 The Rays are also a combined 25-8 against the pesky bird in Tropicana Field over that same time period. Also working into the Rays favor is their lifetime 6-4 record against the Yankees in the last series of the season, including a dismal 1-2 mark in 1999. The Rays past “Heart and Hustle” campaign centered on their rising stars and a few veterans getting their last swings at glory. 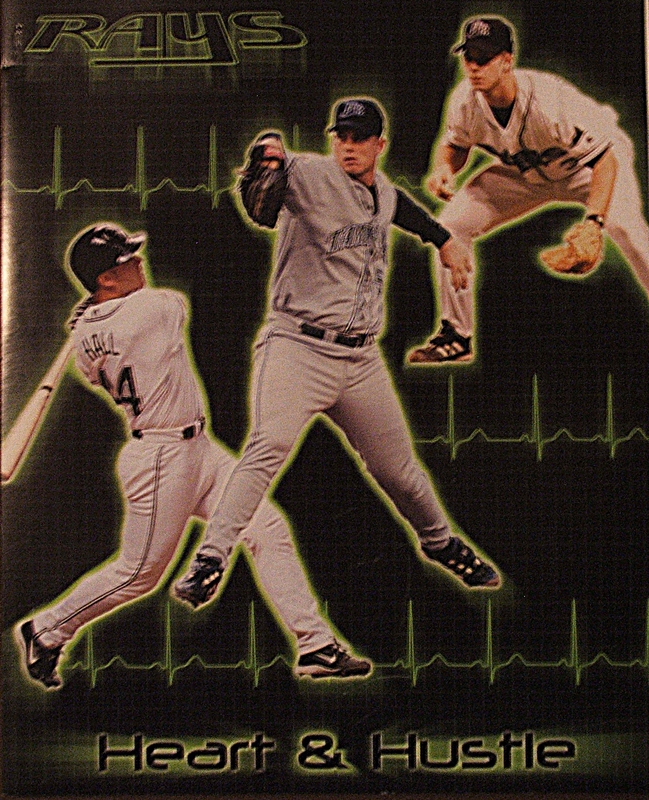 Maybe we should collectively called this Rays prospect of the Rays 2011 Renaissance and possibly Rays history repeating itself, “Heart and Hustle Redux”. I think it fits perfectly like a glove. 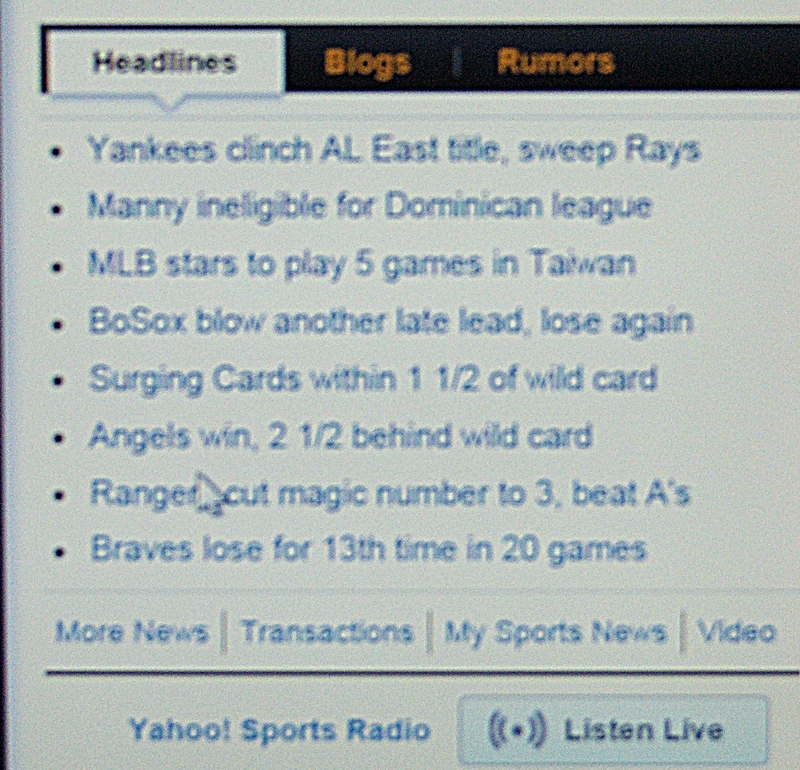 You could not miss the headline, it is the first one when you pop open the Sports area of the Yahoo! “What’s New tab. I have said many times before that people who write blogs, and even post messages on boards across this country get discounted immediately for not being “professionals”. Even if we follow the AP Style book, we face a pessimistically optimistic set of critics daily. But it steams me more than a teapot when a professional organization, one that pays someone to write, edit and accumulate their facts as a job suddenly write something so erroneous. I congratulate the Yankees on securing their title, the Rays faltered when they could have soared, and the victor should get a standing ovation and the sweet taste of victory, but how in the World can a copy editor or even website moderator let such a falsehood dampen their credibility…for such a simple thing. I guess that the writer of that original headline is a die hard Yankee booster, because how else can you write a headline like that without the stamp of approval of a psychic like Miss Cleo. How can you forecast and predict something that hasn’t even been held yet….24+ hours in the future. Maybe he got a pair of those McFly Nike and they tele-ported him to midnight September 23, 2011. If I wrote that error, if I put that sort of erroneous banter of a “sweep” when there was still a game to be played, critics and opinions would fester upon me like a plague. But then again, I am not employed by a mega media giant but just a lone blogger whop gets not a red cent for my muses and rants. I write what I do for the passion of sports, not for glamor, recognition or even a donation. It upsets me when I work hard, write daily and try and do the right things in life then I see someone making a paycheck doing what I love make a dunce cap move like this. So take your Marty McFly predictions, your holier-than-a-minuscule blogger supremacy and stuff it. I know there will be no retractions, no consequences, no repercussions that will mask the distaste I have right now for the person who wrote that headline. Sure I take it personally since I am a long standing member of the Rays Republic, but I take it more personally that it is still visible 13 hours after I first saw it last night. 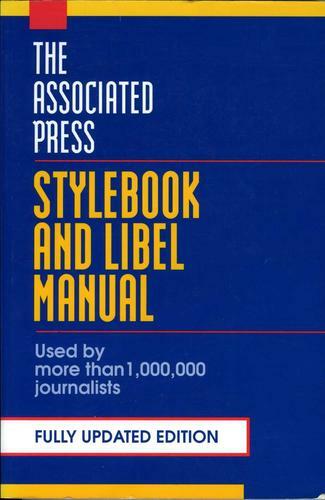 When I first started as a Sports Correspondent with the Evening Independent (the now defunct afternoon sister paper of the St. Petersburg Times) after high school we were each given a copy of the AP Style book. It is still on my shelf some 31 years later, and accuracy is still my number one goal, still what keeps me relevant and of value. When I write it I try and be 105% sure it is accurate and concise, if not, it is set aside. Integrity is the backbone of blogging even if we do not make a cent out of our writing. Maybe Yahoo! And the Associated Press need to open their own copies of their coveted AP Style book again….Just sayin’. 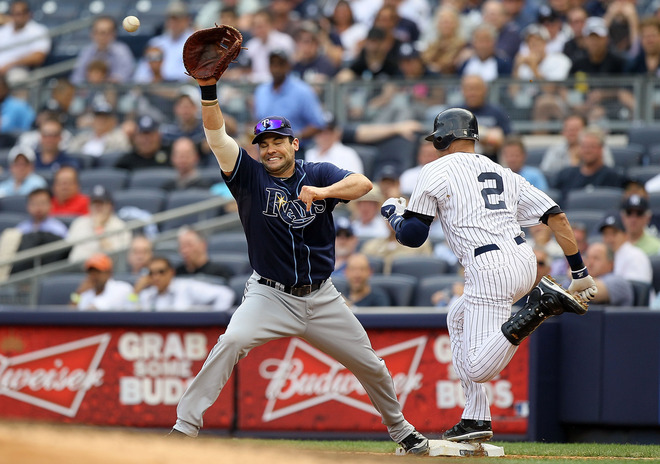 This Tampa Bay Rays versus New York Yankees final 6-game battle royale needs no hype, and definitely needs no extra drama. It is the classic tale of lower (payroll) class rising up against the established norm. A meager collection of gutsy veterans and energized rookies banging their heads with Major League Baseball’s anointed ones who’s own city treats them like royalty. It is the tale of the player who still drives the car he bought with his MLB Draft signing bonus against the one’s who could buy a new auto for everyone in the clubhouse and still have money to valet each car. One is a team steeped in baseball lore with legends of greatness, longevity and feats of power unknown to the other squad. 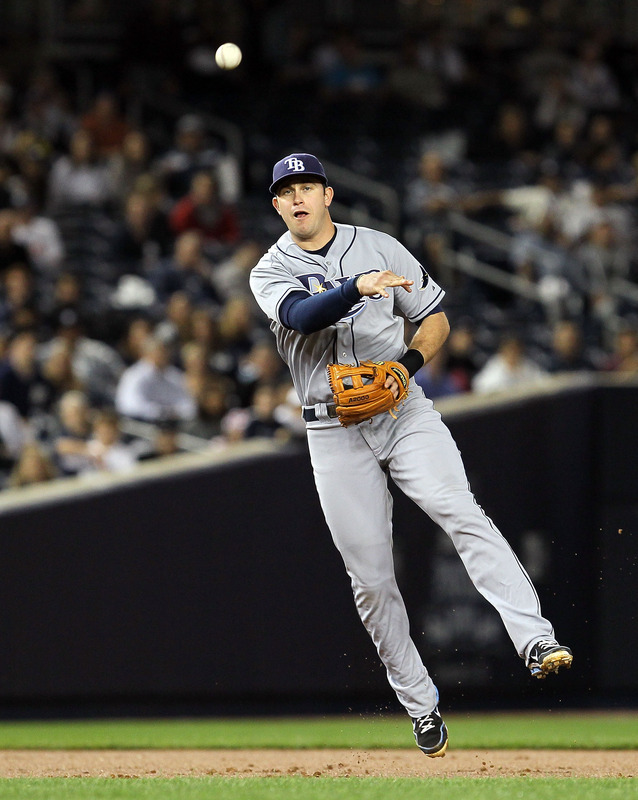 Yankees versus Rays has all that connective lore and more, much more. The pinstripe now have the Rays initial franchise Manager acting as their Pitching Coach, while the Rays have the Yankees long time staple as their Senior Advisor. Interesting enough, so many thought current Yankee skipper Joe Girardi was going to be the Rays Manager after Lou Pineilla until the cerebral Merlot Joe won the gig. There is bad blood that stems as far back as Spring 2008, with the aggressor of that day Rays INF Elliot Johnson on the field this series, and Franklin Cervelli again out with an injury, but not due to a 2011 plate collision with Johnson. Out in the Yankees Bullpen the Rays 2010 closer is being used as a set-up man while former Yankee RP Kyle Farnsworth is biting at the bit to get back into his closer’s saddle. Both of these teams used to train in St. Petersburg, Florida in the Spring, with some saying departed Yankee greats still haunt the old ballfields. Yankees even still call Tampa Bay their Spring home, nestled behind the blue-hued fences off Dale Mabry and within view of an NFL stadium. These teams are so much alike, but so different at the same notion. The Rays have been able to use their Save-a-Lot budget tactics to bring 2 American League East title to their dome catwalks in 3 seasons. The Yankees are the only other team over the last 4 years to equal the Rays AL East haul, and that is if the New York squad can hold off the ram-rod Rays in their final 6-game showdowns in 2011. 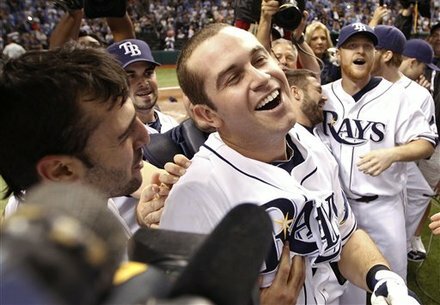 Before last night’s loss, their was fodder sinking and flowing around the web that if the Rays went 10-0, they would command the AL East title for the third time in four seasons, besting the high dollar Boston Red Sox and Yankees with a payroll that is less than their bench players make…combined. Maybe there is something to that “Moneyball” shenanigans. Most have come into this series with the pure thought that the Rays will have to duplicate their “Fenway magic” in the replica Yankee Stadium if they are to fully send the Red Sox Nation into a tailspin, even before their upcoming 3-game weekend slate with these same Pinstripes. More importantly, this Yankee club would like to see nothing better than to see the Red Sox and their Nation try and justify out this recent plunder into the deep recesses of failure. 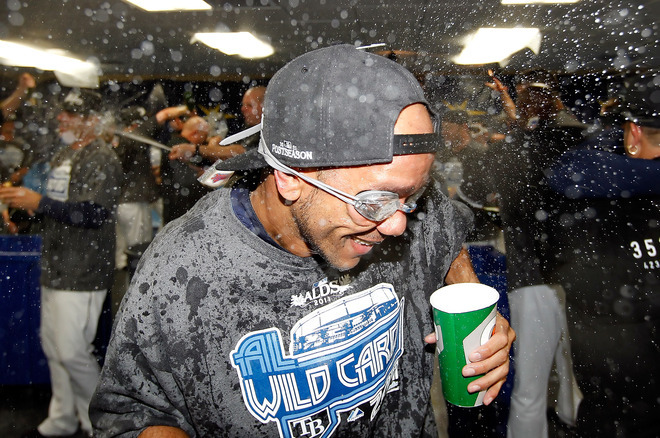 But the Rays are not going into this Yankee series without reservations. Their offense needs to crank itself up a notch, particularly with left-handed hitter aiming for the Rightfield short porch. 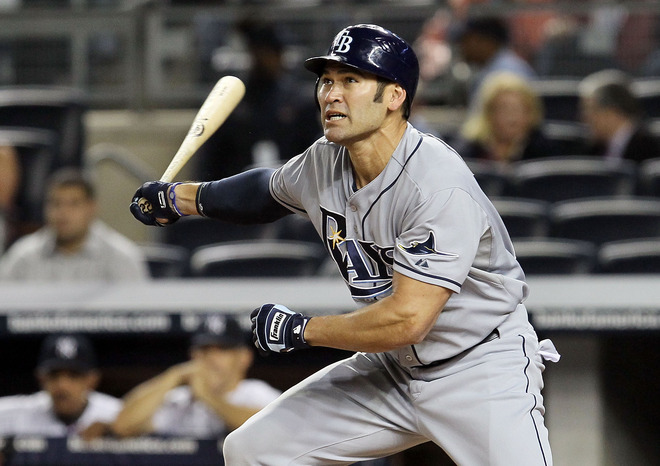 Rays DH Johnny Damon needs to revisit a few of his Pinstripe past moments of pushing the ball into the stands, possibly aiding in the Rays taking 3 out of 4. Even if the Rays play perfect ball both from their defense to their starting pitching, mistakes and lapses in judgment even at the plate can not be tolerated. 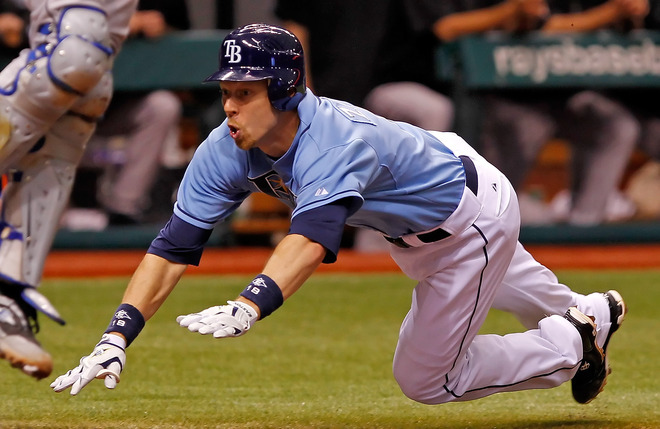 Rays 2B/RF Ben Zobrist has to come into the nightcap game with vision of his newborn daughter dancing in his head, and a goal of planting a few souvenirs into the famed outfield stands. Doesn’t matter who is on the hill to start, the Rays have the hurlers to keep the series interesting, the question is which Rays offense will show up…the anemic Baltimore crew who looked like they had food poisoning during their 3-game debacle or the swatting squad that sent Red Sox Nation scurrying onto Yakey Way talking to themselves about their darking fate. The Rays have nothing to lose, and should play the Yankees with abandon knowing their fate lies firmly within their own hands, The Yankees do not have that luxury. Defeats will bring about worry and doubt heading into the final stretch, which would favor their adversary. Consider the fact that the Yankees have to play both Tampa Bay and Boston over that 10 game stretch, and the pressure cooker is gaining steam for the Yankees. The possibilities of securing back-to-back series wins is firmly planted within the minds of the Rays, and the Bombers will do everything short of urban warfare to secure and safely conceal their quest of another AL East crown. Emotions will be sky high on both sides of the field as the Yankees still have a lingering hole in their souls after losing the AL East title on their last grasp in 2010. 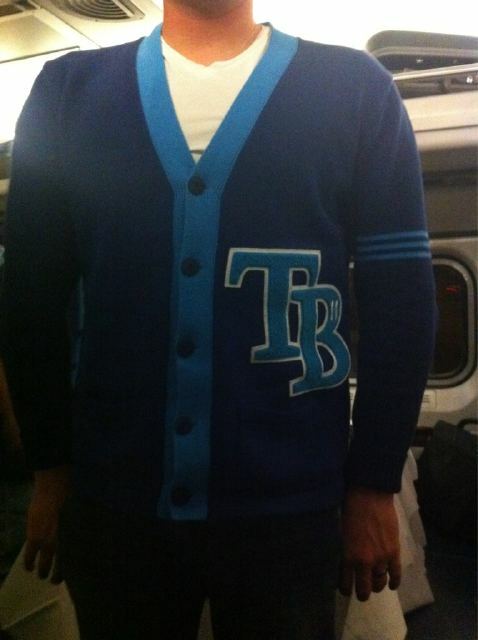 If the Rays play the way they did in their 4 games in Boston and take the game to the Yankees, even during their day/night double-dose, this Rays team might have to all go have dinner at the Cracker Barrel a few blocks from the St. Petersburg/Clearwater Airport. For if this Rays team does the same to the Yankees that they just did to the Red Sox, when the Rays land late Thursday evening maybe Maddon should buy the whole team “meatloaf with a side of gravy” upon their return. I can smell it already. I still remember the day Coach Brown called me into his office. There stood the gruff-voiced man who put me through enough drills to tire the entire ROTC brigade. The authority figure who had me run enough laps to encircle the Earth, who pushed me miles beyond my previous peak performance to be a more solid and well-rounded athlete…and he was smiling. In the palms of his hands laid the ultimate gift of gratitude a Coach can bestow an athlete in High School. A symbolic token of their appreciation for the gallons of sweat and game day magic that embodied that season’s defeats and triumphs. To some it was a simple piece of woven cloth fashioned into a capital letter “D”. 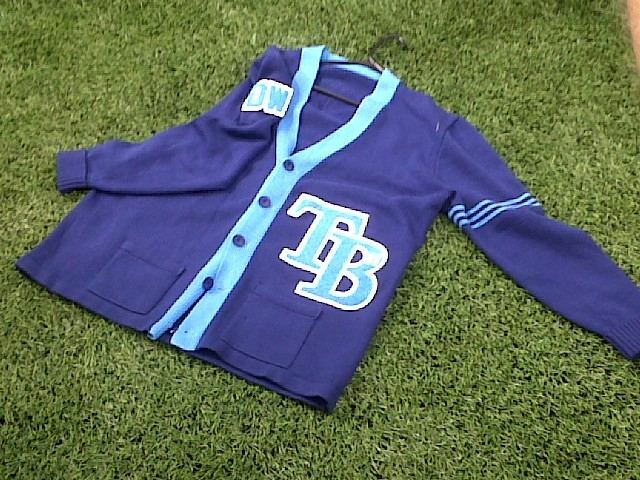 When I first heard about a week ago that Tampa Bay Rays Manager Joe Maddon was thinking of having his brood wear 1950’s style letterman sweaters, I was a bit concerned. Most of his squad had been presented these tokens of athletic performance before in their teen athletic endeavors, and I wondered if it might be a bit…sophomoric. But I am wrong thinking that, for the task this Rays squad performed over their last 4 games definitely embodies and shows the work and pride needed to be presented with a woven “TB”. I was an honor this morning to click upon an web article and see the entire Rays team, including staffers wearing the blue Rays sweaters also with their uniform numbers set in Carolina Blue. 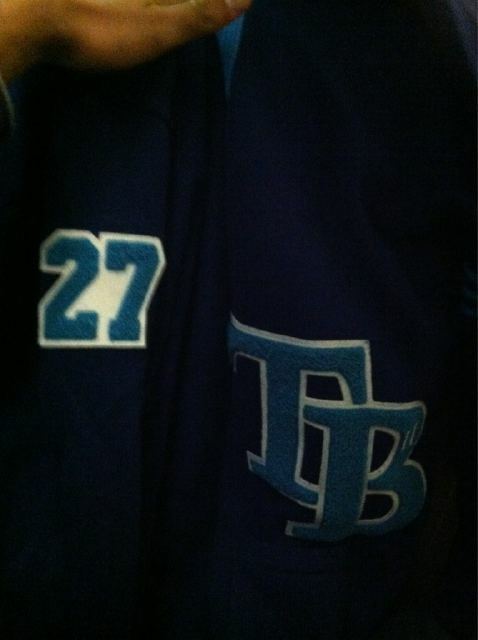 Just like the Rays last 4 games, the letters and numbers pop off the jersey with confidence, commitment and a determination to conclude their drive to the post season. 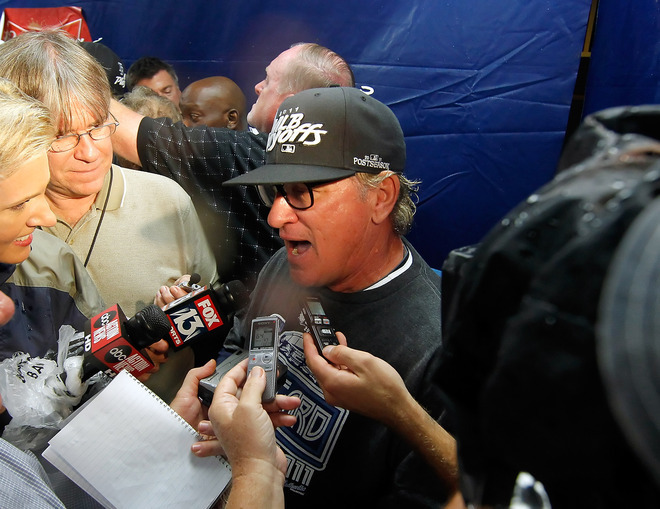 Sometimes Maddon does remind me of Coach Brown. Always pushing always striving for a little bit more out of you to achieve more and more, and bringing that dose of confidence with you. 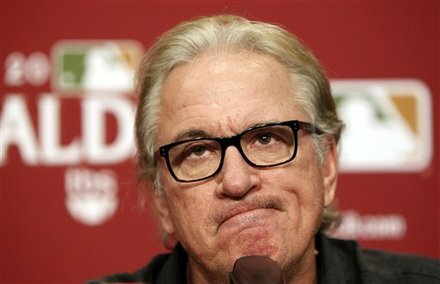 Heading into another 4-game battle against the New York Yankees, such high levels of pride and confidence need to be maintained, but I have a feeling Maddon has that also under control. The wearing of a letter is the ultimate symbol of prestige and honor. 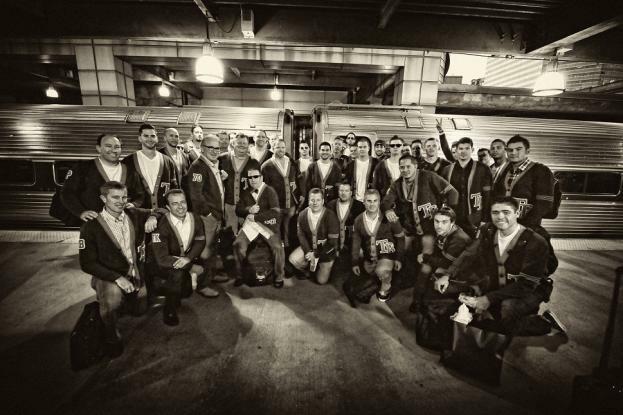 I can think of no better group than this 2011 squad to wear the “TB”. 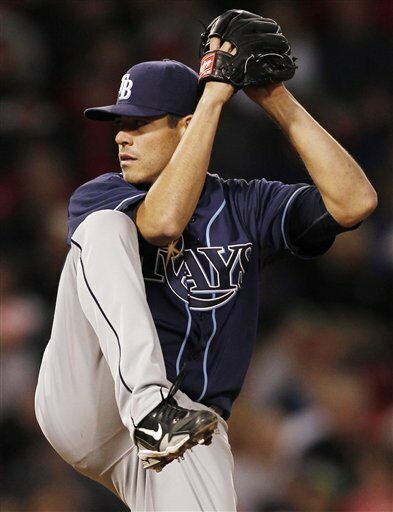 You have made an old letter man proud to be a Rays fan.